AccorHotels will open its seventh SO/ boutique branded hotel in Auckland. 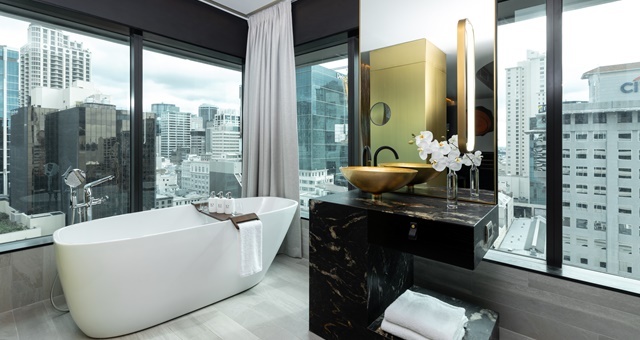 AccorHotels will bring its luxury design brand SO/ to New Zealand, today announcing the brand would occupy the former Reserve Bank building in downtown Auckland. Only the seventh SO/ in existence around the world, SO/ Auckland will feature 130 rooms, a café, Club Signature Lounge, SO Spa and SO Fit fitness centre complete with indoor swimming pool. On the 15th floor will be a Harbour Society restaurant with a menu designed by Chef Marc de Passorio. Signing on as design partners for the hotel interiors are Kiwi fashion visionary brand WORLD. Designers will impress upon the spaces of the new hotel their signature brand of energy and social character. SO/ Auckland General Manager Stephen Gould said the decision to bring the SO/ brand to New Zealand now was to capitalise on the country’s booming tourism economy and an eagerness to showcase the vast natural backdrops of New Zealand were the key to the country as one of the most essential places to visit. “We needed a designer with an approach as bold and enterprising as the SO/ brand; energetic, social, bursting with individual character but also inherently a reflection of Auckland,” Gould added. More than three years of design work has been put into staff uniforms. The resulting design reflects a stylised topographical layout which makes use of New Zealand’s abundant volcanoes and encompasses the deep connection enjoyed by Indigenous populations. Dutch design firm Moooi has fitted out the ground floor of the new hotel. The design is a multi-layered sensory experience from the mind of Marcel Wanders. Gould said guests will immediate feel as though they are somewhere else.